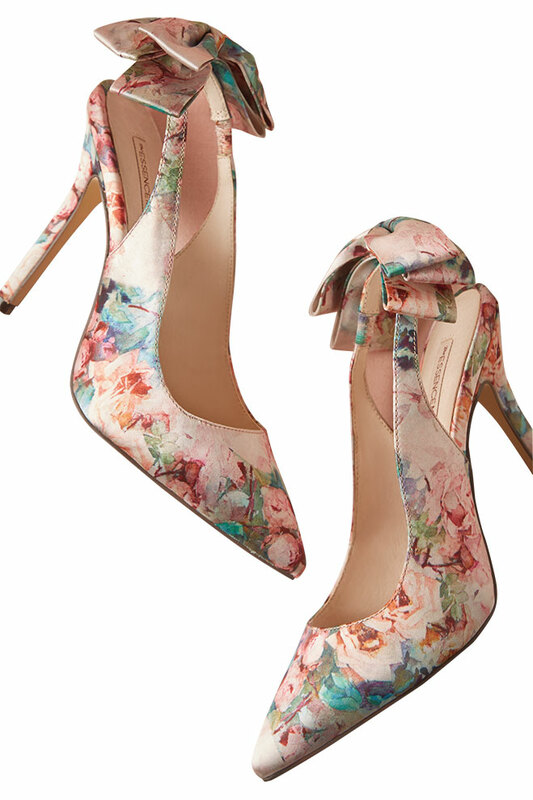 A romantic finishing touch, the satin “Floriography” pump is awash in blue, pink and peach watercolor florals. $160, from BHLDN. gilded in 23K gold embellished with white antique flowers and keshi pearls. back loose tendrils. $125 each, at R-Mine Bespoke in Studio City. Chloe & Isabel’s new bridal collection. bring a subtle touch of glamour to any look. $275, from R-Mine Bespoke. 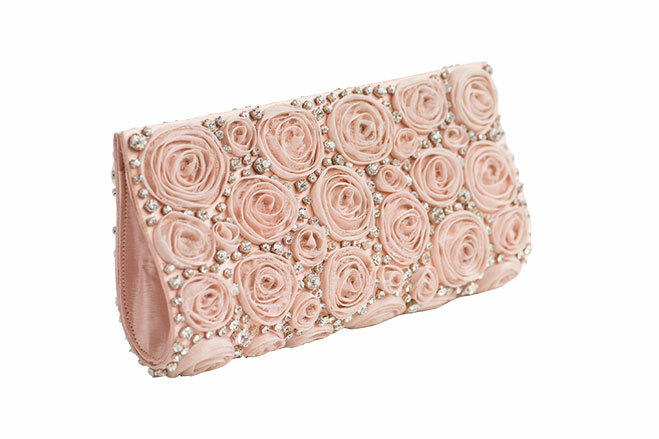 a soft blush with rhinestone embellishments. muse, the Justin & Taylor “Perle” handcrafted bracelet features crystals and freshwater pearls arranged into delicate floral blooms. $60, from BHLDN in Beverly Hills. locks or added to a sash, Los Angeles–based Erica Koesler’s sequined flower with navette rhinestones adds a sparkling touch. 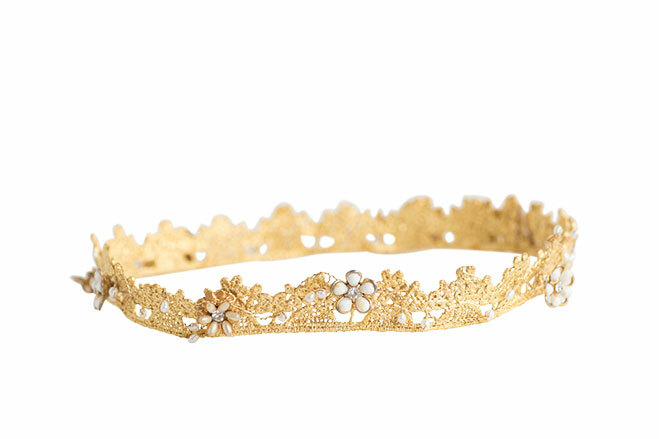 Los Angeles–based designer Trace Henningsen’s delicate, handcrafted “Petite Aine” crown features vintage lace gilded in 23K gold embellished with white antique flowers and keshi pearls. $575, at tracehenningsenbridal.com. 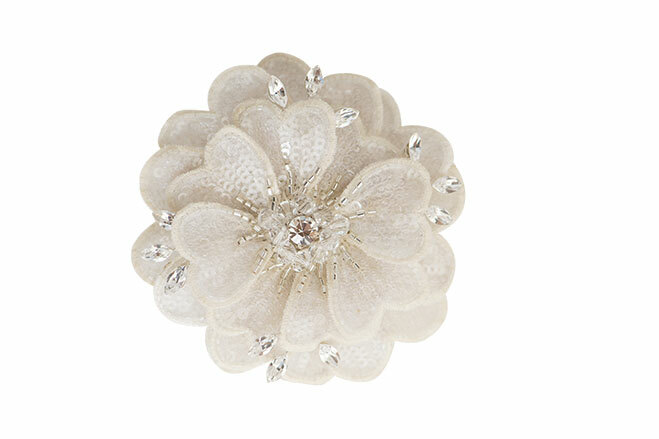 Dvnchi’s delicate Swarovski crystal-flowered bobby pins are perfect for sweeping back loose tendrils. $125 each, at R-Mine Bespoke in Studio City. 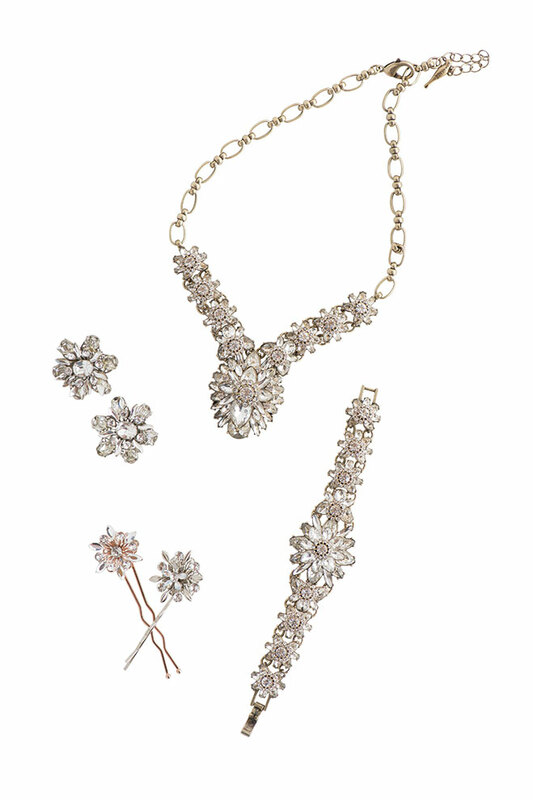 Dvnchi’s Swarovski crystal bloom earrings bring a subtle touch of glamour to any look. $275, from R-Mine Bespoke. 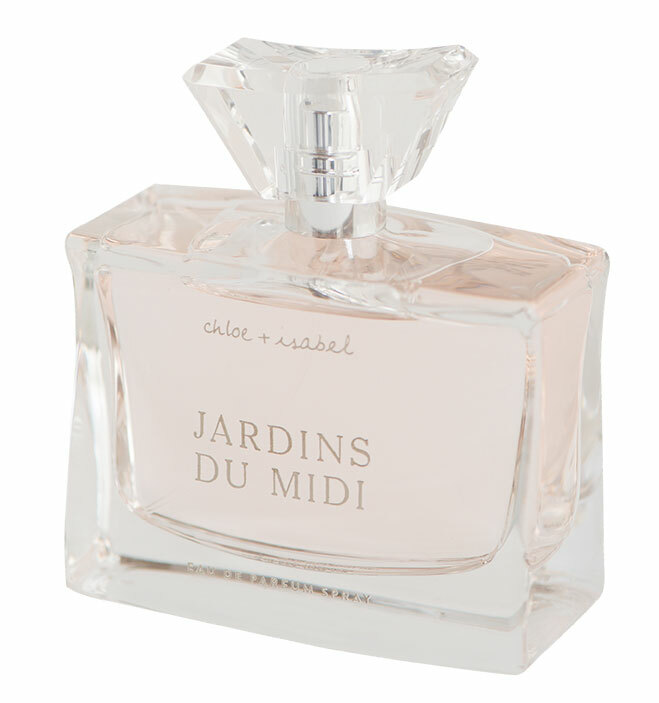 Inspired by lush orchards in the south of France, Jardins du Midi’s bright scent mingles bergamot, jasmine and white violet with a hint of peach nectar and vanilla. $58, at ChloeandIsabel.com. 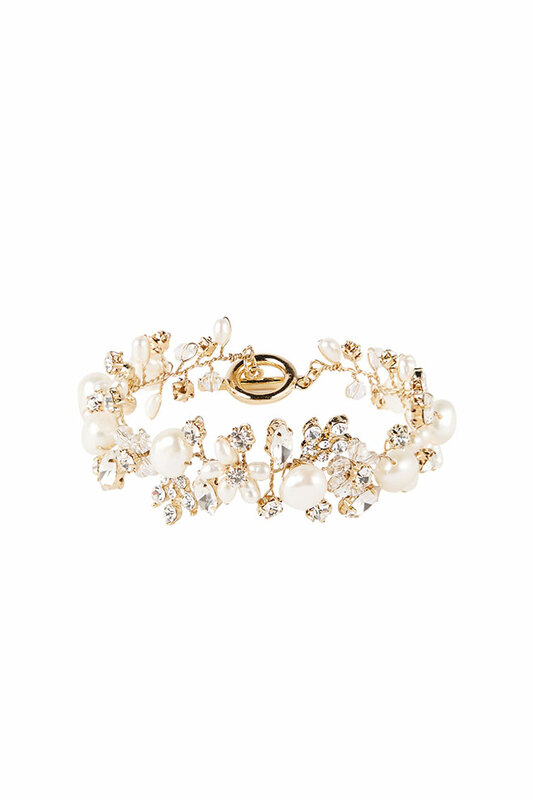 With Mother Nature as the designers’ muse, the Justin & Taylor “Perle” handcrafted bracelet features crystals and freshwater pearls arranged into delicate floral blooms. $60, from BHLDN in Beverly Hills. Whether nestled in loose locks or added to a sash, Los Angeles–based Erica Koesler’s sequined flower with navette rhinestones adds a sparkling touch.$280, at EricaKoesler.com.